MAJOR SPOILERS! No, seriously, even the GIFs are spoilers. NO I CAN’T WAIT TILL FEBRUARY! NO AMC! YOU CAN’T! Ahem. This episode was amazing. It really had to be, after the build up of this series something big was bound to happen. It began with the introduction of a fan-favourite character, TYRESE! 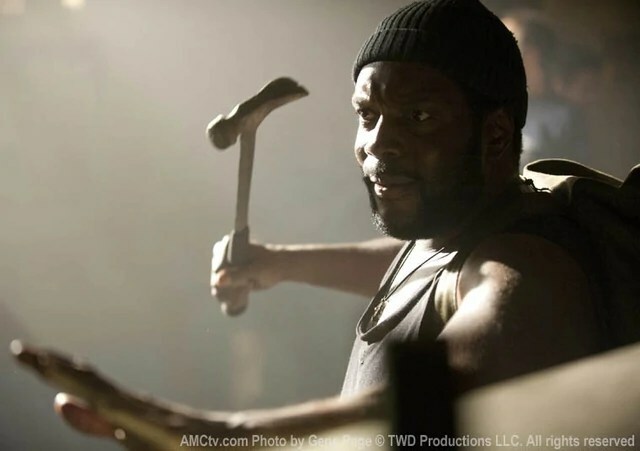 I was over the moon to see Tyrese in the series, with his trusty hammer and everything. He also looks a lot like his comic counterpart, but we’ll just have to wait and see if his back story is the same as the comics. Back at Woodbury we have more creepy Governor/Daughter scenes. As it turns out, he keeps his daughter (Penny) locked up in a cage/cupboard in his reanimated walker head room. I love these scenes between him and his daughter as they really make the Governor seem especially messed up. On the other side of Woodbury, Glenn and Maggie are still in prison. But Glenn has an idea! He snaps a dead walkers arm (the walker Merle through at him last week) and he pulls the bones out. He and Maggie then have a makeshift knife! When 2 guards come to let them out Maggie stabs a guard in the neck with it, a really satisfying scene considering what was done to them last week. Meanwhile, the group manages to get inside Woodbury with help from Michonne. Once in they hear gunshots (the guard Maggie stabbed fired at the floor) They manage to sneak by in the panic and rescue Glenn and Maggie. But getting out doesn’t prove as easy. Michonne however has split from the group to go and wait for the Governor. In the middle of this epic shootout between Rick’s ragtag team and the heavily armed Woodbury citizens, Daryl leaves the group to go find Merle whilst Rick begins to hallucinate. This is when we get a surprise appearance from one of my favourite characters. A character who died last season. That’s right, it was Shane! Yay Shane! Now with extra beard. Rick hesitates and “Shane” shoots and kills Oscar as the group is climbing out of Woodbury. It was great to see “Shane” but it sucked that Oscar had to die. Maggie stops him from turning as Rick shoots, discovering that it wasn’t Shane, it was an ordinary Woodbury guard with just a faint whiff of Shane about him. I would really love for this to be a recurring thing now, Rick seeing dead members of the group or perhaps even people he’s killed in the past. In the Governors room, Michonne comes across his delightful collection of heads. And even worse. she discovers Penny. The Governor comes in to stop her before putting down his gun and pleading with her. Michonne puts Penny out her misery anyway, with a sword through the head. The two of them fight, with The Governor pushing Michonne into the walker head collection. Michonne gets he own back by jamming a piece of broken glass in the Governors eye. It’s at this bit where the Governor seems different from his comic counterpart. I actually felt sorry for him. The fight is broken up by Andrea who allows Michonne to leave. The Governor is left maimed on the floor, cradling the body of his dead daughter. I know he’s a bad guy and he’s done some horrible things, but I still felt sorry for him. However it seems that is about to change. When the Governor has had the glass removed, he seems nastier than ever. Andrea on the other hand is as naive as ever, THERE ARE ZOMBIE HEADS ON THE FLOOR! HE’S GOT HIS DEAD DAUGHTER IN HIS ARMS! GET OUT WHILE YOU CAN! Ok, ok. I realise she does mention this to the Governor but his answer “I made myself look at them. (To) Prepare myself for the horrors outside” is not good enough, dammit Andrea! She seems to be the only one who can’t see him for what he really is. Then again, if she is actually in love with him, it’s going to be interesting to see which side she chooses when she meets back up with the old group. Ok, that was brilliant. The best part is, it’s only the mid-season finale, imagine the awesomeness that we’ll get at the end of this season. My only compliant of this first half of the season is Andrea, She is blind to the Governors tricks and she just seems stupid because of it. However, at the end of the episode she did seem to be coming to her senses, so we’ll have to wait and see. Overall, an amazing episode to finish off what has been the best run of episodes on the show so far. Bring on February!